December 1: Karen’s Dance Studio presents A Holiday Dream, 11:30am, 2:30pm & 6:30pm at North Middle School Auditorium (102 N Gray Ave). This 2018 Holiday showcase will benefit the Lafayette House of Missouri. Tickets are $2 at the studio or at the door. The Lafayette House is in need of gifts for girls and boys of all ages, new and unwrapped. Santa will be there for pictures pre-show and will have his toy boxes ready for donations. More information: Nicole Drouin Amayo, 417.623.1093. November 29–December 2: Stained Glass Theatre Joplin and Ozark Christian College present A Christmas Carol, 7:00pm (Sundays 2:30pm) at Ozark Christian College Chapel (1111 N Main St). A Christmas Carol tells the story of Ebenezer Scrooge, an old miser who is visited by the ghost of his former business partner Jacob Marley and the Ghosts of Christmas Past, Present, and Yet to Come. After their visits Scrooge is transformed into a kinder, gentler man. Tickets: $10 Adults, $8 Group of 10+, $5 Kids. Visit occ.edu/tickets to reserve tickets. More information: Matt Stafford, 417.626.1221. November 30–December 1: Midwest Regional Ballet Company and School presents Beauty and the Beast, 7:00pm at Thomas Jefferson Independent Day School (3401 Newman Rd). This contemporary ballet is based on the book by the French author Gabrielle-Suzanne de Villeneuve published in 1740. The ballet is comprised of pointe, contemporary dance, and aerial silks. It is a tale as old as time! Recommended to all ages. More information: Kaye Lewis, 417.439.9549. December 1: MSSU Department of Music presents A Seasonal Choral Flourish, 7:30pm at St. Peter the Apostle Catholic Church (812 S Pearl St). This performance will feature Missouri Southern State University Chamber Singers, Madrigal Singers, and Concert Chorale groups. David Sharlow will be the conductor for the night, accompanied by Glenda Austin. Pre-Concert music, performed by MSSU Trumpet Ensemble and Brass Quintet, will begin at 7:00pm. This performance is free and open to the public. More information: David Sharlow, 417.625.9562. December 3: Southern Jazz Orchestra World Premiere, 7:30pm at Missouri Southern State University, Corley Auditorium in Webster Hall (3950 Newman Rd). The Southern Jazz Orchestra, under the direction of Freddie Green, will perform the world premiere of an original work composed by David Sharp. The composition is based on traditional Scandinavian folk music played in a jazz style. The work, yet to be titled, will be performed in four movements and will feature the artistry of Sharp on saxophone and MSSU’s director of jazz studies, Dr. Phillip C. Wise, on trombone. Sharp is a professor of instrumental music and jazz at Indian Hills Community College in Ottumwa, Iowa, where he directs the Indian Hills Jazz Band and teaches courses in music theory, music appreciation, jazz appreciation, and applied woodwinds. Sharp is a prolific composer and arranger of jazz, big band, brass ensemble, and orchestral music. His works have been performed and/or recorded by numerous scholastic groups and professional jazz performers throughout the world, including: Paquito D’Rivera, Claudio Roditi, Terrell Stafford, Bobby Watson, Karrin Allyson, the Swiss Jazz Orchestra (Bern), the Landes Jugend Jazz Orchester Hessen, the Kansas City Jazz Orchestra, the Des Moines Big Band, and the Topeka Jazz Workshop. He has also written and published two textbooks on jazz history and appreciation. This event is part of MSSU’s Nordic Semester – bringing the history and culture of Sweden, Norway, Denmark, Finland, and Iceland to the MSSU campus throughout the Fall 2018 Semester. More information: Chad Stebbins, 417.625.9736. December 5–9: Joplin Little Theatre presents A Swingin’ Little Christmas, 7:30pm (Sunday 2:30pm) at Joplin Little Theatre (3008 W 1st St). This Big Band Christmas Spectacular features the best Christmas hits, along with some new features to enjoy. Set in 1952, the Collins Lounge in downtown Cleveland is hosting an evening concert called “A Swingin’ Little Christmas.” The local performers are trying to achieve fame, but it won’t happen without some hiccups along the way. This show will have you clapping along, tapping your toes, and laughing in no time! Tickets: $18 General Admission, $15 Seniors/Students, $8 Children (Age 12 and Under). More information: Cecie Fritz, 417.623.3638. December 8 & 9: Joplin High School Theatre Department presents Chaos in Fairytale Forest, 2:00pm at Joplin High School Performing Arts Center (2104 Indiana Ave). When Red Riding Hood trips over a root in the forest, she spills her basket of goodies only to encounter Hansel and Gretel wanting her food basket. They have finished off the gingerbread house and are now running from the witch. Poor Red is confused — there’s no witch in her story. But when Bambi scampers in, chased by Robin Hood, who is running from Goldilocks because he shot arrows at her three bears, Red knows the fairy tale forest is in total chaos. From Snow White to the heartless Tin Man and the Headless Horseman to Rapunzel to the White Rabbit, the story just gets crazier and crazier! Tickets: $3 Adults, $1 Children. Tickets may be purchased at the door. More information: Ashley Trotnic, 417.625.5230. December 8: Christmas Is What You Make It, 3:00pm at Park Plaza Christian Church (3206 S Indiana). Enjoy the sweet sound of the organ and the music that celebrates the birth of Jesus Christ. Free and open to the public. More information: @joplinorganists or email jsbptech@gmail.com. December 9: MSSU Choral Society Winter Concert, 3:00pm at St. Paul’s United Methodist Church (2423 W 26th St). Dr. Susan Smith, Director of Vocal Studies at MSSU is the new Artistic Director and Conductor of the chorus after the retirement of Dr. Al Carnine. Smith and accompanist Clint Newby have grown the community-based Choral Society to over 60 voices and will present its Winter program with music that will appeal to people of all ages. The concert opens with George Handel’s O Sing, Rejoice, so very appropriate for the season. It is followed by a medley of familiar Christmas songs, Irving Berlin’s Christmas, and The Chanukah Song/We Are Lights, by Stephen Schwartz. The featured major work, Child of Hope, is written by Mark Hayes with lyrics by John Parker. It provides a Christmas message of encouragement and peace and is energetic and compelling, yet poignant in its delivery. This is the first time the Choral Society has performed this work and it fast became a favorite. Several chorus members will narrate and provide solos in this masterful work. This performance is free and open to the public, all donations will be gratefully accepted. More information: Wally Bloss, 417.208.9654. December 13: Heartland Opera Theatre presents Amahl and the Night Visitors, 7:00pm at Christian Life Center (North 1111 I-49BL, Neosho, MO). Lyrical music evokes the first Christmas Eve, when three kings pay a visit to a young boy and begin their magical journey to see the Christ child. The opera, sung in English, will be staged in the elegant sanctuaries of three local churches. A perfect gift for the entire family! More information: Michael Gregory, 417.385.1454. 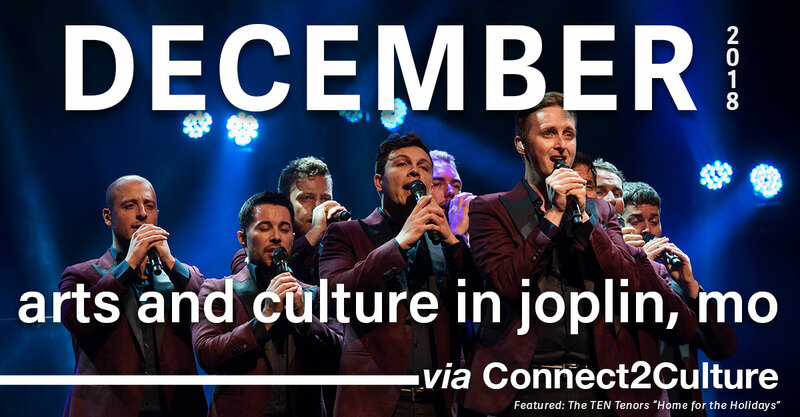 December 13: Connect2Culture presents The TEN Tenors “Home for the Holidays”, 7:30pm (doors 6:30pm) at Joplin High School Performing Arts Center (2104 Indiana Ave). The TEN Tenors are undoubtedly one of Australia’s greatest entertainment success stories, with more than 90 million people worldwide embracing their unmistakable charm, camaraderie, and vocal power. Following 20 years of sell-out performances across the globe, including more than 2,500 of their own headline concerts. Celebrated for their colorful repertoire, breathtaking arrangements and powerful live performances, The TEN Tenors respectfully tip their hats not only to the great classical composers, but to contemporary music’s most popular artists. From Queen, Bowie, Lennon and Winehouse, an evening with The TEN Tenors is guaranteed to surprise and delight in equal measure. Amidst their own explosive live concert experiences and remarkable achievements including six platinum and gold records and over 3.5 million concert tickets sold, The TEN Tenors have also performed alongside countless music legends including Andrea Bocelli, André Rieu, John Travolta, Nicole Kidman, Geoffrey Rush, Keith Urban, Rod Stewart, Alanis Morissette, Sarah Brightman, Willie Nelson, Katherine Jenkins, and Christina Aguilera. Come ready to have The TEN Tenors walk you through a musical winter wonderland that truly captures the essence of the Holidays for the whole family! Tickets: $20–$40. Purchase tickets at connect2culture.org, 1.800.514.3849 (etix is the exclusive ticketing provider), or at Joplin Empire Market any Saturday from 10:00am–3:00pm. Groups of 10-50 receive 20% discount on tickets. More information: Emily Frankoski, 417.625.6683. December 14: Heartland Opera Theatre presents Amahl and the Night Visitors, 7:00pm at St. Peter the Apostle Catholic Church (812 Pearl Ave). Lyrical music evokes the first Christmas Eve, when three kings pay a visit to a young boy and begin their magical journey to see the Christ child. The opera, sung in English, will be staged in the elegant sanctuaries of three local churches. A perfect gift for the entire family! More information: Michael Gregory, 417.385.1454. December 14: Fountain City Brass Band, 7:00pm at Thomas Jefferson Independent Day School (3401 Newman Rd). America’s top brass band, the virtuoso musicians under the direction of Dr. Joseph Parisi, present a varied program including familiar folk tunes, ballads, Broadway and Hollywood favorites, marches, and classical and contemporary masterworks. Founded in 2002 in Kansas City, Missouri, this wonderfully spirited band is now in its 11th season, and continues to perform throughout America and abroad as the current U.S. Open Brass Band Champions. More information Robert Carlson, 417.781.5124. December 14 & 15: The Miniature Nutcracker Suite, 7:30pm at Carthage Jr. High (714 S Main St, Carthage, MO). This beloved holiday classic will feature the youngest Midwest Regional Ballet School dancers performing all of the holiday classic dances we all know and love. Tickets will be sold at the door. $8 General Admission, $75 for 10 tickets. More information: Kaye Lewis, 417.439.9549. December 15: Heartland Opera Theatre presents Amahl and the Night Visitors, 7:00pm at First Methodist Church (617 S Main St, Carthage, MO). Lyrical music evokes the first Christmas Eve, when three kings pay a visit to a young boy and begin their magical journey to see the Christ child. The opera, sung in English, will be staged in the elegant sanctuaries of three local churches. A perfect gift for the entire family! More information: Michael Gregory, 417.385.1454. December 16: Four State Symphonic Winds Concert, 3:00–4:30pm at Carthage Junior High School Auditorium (714 S Main St, Carthage, MO). This will be the second concert of the season for the Four State Symphonic Winds, an adult band comprised of musicians from the Four State Area – Missouri, Kansas, Arkansas, and Oklahoma. The concert is free and open to the public. December 17 & 18: Stained Glass Theatre Joplin Auditions An Evening with Sherlock Holmes, 7:00–9:00pm at Stained Glass Theatre Joplin (2101 Annie Baxter Ave). Auditions consist of cold readings from the script. Visit Stained Glass Theatre Joplin’s website to download the audition form. Performance dates: February 14–24. More information: Tammy Aggus, 417.553.0755. December 26: The Coda Concert House presents Tyrannosaurus Chicken, 6:30pm (doors 6:00pm) at The Coda Concert House (2120 E 24th St). Tyrannosaurus Chicken is a duo unlike any other. Rachel Ammons and “Smilin’ Bob” Lewis are madcap sonic alchemists, fusing Delta blues, psychedelia and trance music with reckless enthusiasm. “We call it Arkansas hill stomp music” Smilin’ Bob identified with the Delta Blues from the very beginning, growing up in a small town where he was exposed to it by his coal miner father’s African American friends on front porches and house parties. After Rachel got back from college and 10 years of classical violin, she heard her family friend Smilin’ Bob play some slide guitar and was instantly hooked. She lost some of the classical rigidity, they both stretched the limits and T-CHiKN (named for scientific research unlocking dinosaur DNA in the common chicken embryo) was born. Their influences include jump blues, swing and piedmont blues, delta, rock, southern gospel, dance/trance. Email Jeff Morrow at info@codaconcerthouse.com to make reservations. A confirmation email with the address, directions, parking, etc. will then be sent in return. 100% of all proceeds go directly to the artists performing. December 1: MSSU Senior Show Opening Reception, Noon–2:00pm at Missouri Southern State University, Spiva Art Gallery (3950 Newman Rd). Three Missouri Southern art students will be featured in this Spiva Art Gallery Senior Exhibit. The exhibit features the work of senior visual art majors Nicholas Anderson and Shay Thomas, as well as senior art education major Jessica Elliot. Anderson describes his graphical narratives as “an exploration of sequentialism and a method of absentee communication,” and encourages the audience to interact with his artwork. Elliot will display paintings, drawings and sculptures of animals. She says “the animals are a symbol for students and personify the diversity of the modern classroom.” Thomas contributes a variety of prints to the exhibit and describes her work as “a weird combination of Japanese aesthetic and dark themes.” Those in attendance at the reception will have the opportunity to speak with the artists about their work. More information: Joan Kearney, 417.625.9563. December 1: Pawpaw Patch Productions Open House, 12:30–2:30pm at Pawpaw Patch Productions (4940 Highway 43, Joplin, MO 64804). The public is invited to stop by and check out the new studio of Pawpaw Patch Productions, enjoy refreshments, and decorate Christmas cookies. There will be lots of cured polymer clay cookies (for a small fee) to decorate with paint, add ribbon, and have ornaments for your tree or personalized gifts. More information: Cyndi Cogbill, 417.553.1583. December 1: The Met Live in HD presents The Magic Flute, 12:55pm at Regal Cinema Northstar 14 (201 S Northpark Ln). Julie Taymor’s dazzling production returns to select cinemas this holiday season in an encore presentation of the company’s first-ever Live in HD transmission. Tickets: $24 Adult, $21.82 Senior, $17.45 Child. Click here for more information about Fathom Events. December 1 & 2: Expressions of the Soul, 1:00pm at George Washington Carver National Monument (5646 Carver Rd, Diamond MO). Carver had a passion for art and believed that his creations were expressions of his soul. See images of Carver’s artwork that he used to convey a sense of serenity and personal rejuvenation. This event is free and open to the public. More information: Randall Becker, 417.325.4151. December 1: Post Art Library Holiday Tea, 2:00–4:00pm at Post Art Library, Post Reading Room (1901 E 20th St). Enjoy tea, holiday treats, and a performance, including holiday carols and a sneak peek of Heartland Opera Theatre’s upcoming production, Amahl and the Night Visitors.This event is free and open to the public. More information: Jill Sullivan, 417.623.7953 x1041. December 4: Movie in the Park: Holiday Edition, 4:00–6:00pm at Joplin Memorial Hall (212 W 8th St). Bring a blanket and/or chairs and enjoy the movie Home Alone on an inflatable movie screen inside Memorial Hall. The movie is rated PG with a run time of 1 hour 43 minutes. Popcorn, candy, and drinks will be available to purchase. This event is free and open to the public. This event is a collaboration between Joplin Parks and Recreation, the Joplin Convention and Visitors Bureau, and Frank Fletcher Toyota. More information: Carla Bond, 417.625.4750. December 4: Chat N Craft (Adults), 5:30–8:00pm at Joplin Public Library (1901 E 20th St). An adult crafting group that meets on the first Tuesday of the month. All types of hand work welcome. Share ideas, tips and tricks with other crafters. Bring your current craft project and join for laughter, friendship and fun! More information: 417.623.7953, chatncraft.wordpress.com. December 6: Spiva Trivia Night (Ages 21+), 6:00–8:00pm at Spiva Center for the Arts (222 W 3rd St). Rounds begin every 30 minutes in Spiva’s Main Gallery. $5 per person each round and winners take home 75% of the cash. Beer available to participants. This is a 21 and up event. More information: Jade Henning, 417.623.0183. December 7: Dr. Valerie Watts Flute Masterclass, 2:00–4:00pm at Missouri Southern State University, Fine Arts Building, Rm 108 (3950 Newman Rd). Dr. Valerie Watts is Professor of Flute at the University of Oklahoma where she teaches flute to graduate and undergraduate flute students. She is principal flute in the Oklahoma City Philharmonic Orchestra and a member of the Oklahoma Woodwind Quintet, woodwind-quintet-in-residence at the University of Oklahoma, since 1988. During the summer Watts performs as principal flutist with the New Hampshire Music Festival Orchestra. She has appeared with several ensembles and as soloist nationally and abroad, including the Rochester Philharmonic Orchestra (NY), the Eastman-Dryden Orchestra (Switzerland & Germany), Bach Camerata (Santa Barbara, CA), Patterson-Watts Duo (Brazil), and The Oklahoma Woodwind Quintet (England & Austria). This event is free and open to the public. More information: Dr. Keith Talley, 417.625.3061. December 7: First Friday WineShare, 6:00–8:00pm at Newton’s Jewelers (428 S Main St). Join Downtown Joplin Alliance for the last WineShare of 2018! Finishing the year out back at Newton’s Jewelers just in time for the holidays. Sip wine and check out some of the beautiful pieces they have available. WineShare is a national event that takes place on the First Friday of each month. It’s a great opportunity to meet new friends or catch up with old ones. It’s also a fantastic way to kick off date night! Feel free to bring friends or colleagues, as well. Bring a bottle of wine or a craft beer and The Downtown Joplin Alliance will take care of the rest. As always, there is no charge to attend WineShare and everyone 21 years of age and older is welcome. This event is free and open to the public. More information: Lori Haun, 417.501.9649. December 8: Holiday Open House, 1:00–3:00pm at George Washington Carver National Monument (5646 Carver Rd, Diamond, MO). The park staff and volunteers invite the public to a holiday celebration with seasonal music, crafts, and refreshments. More information: Randall Becker, 417.325.4151. December 8: MSSU Senior Show Opening Reception, 3:00–6:00pm at Missouri Southern State University, Spiva Art Gallery (3950 Newman Rd). The BFA Senior Show at Missouri Southern State University will feature Jocelyn Lechuga, Makenzie Wesley, and Lydia Humphreys. Jocelyn’s work is about her Mexican heritage. Folk stories, Latino icons, music, and mask-wearing wrestlers are just some of it. She blends pop culture with her heritage, drawing inspiration from both equally. She also enjoys exploring other important things that make Mexican culture what it is, and how it’s represented to the world – such as the Day of the Dead. The unparalleled beauty and diversity found in nature is a source of inspiration for Makenzie as she creates her current body of work. Being a native of the Midwest, her ceramic work contains imagery of indigenous moths and butterflies that populate this region. The metamorphism lepidopterans undergo parallels the process of ceramics. As a moth or butterfly must change form and nature into a different state, Makenzie’s ceramic pieces must endure a metamorphosis of their own to reach completion. She challenges human perspective and our interaction with insects by magnifying them to a larger scale, forcing the natural world to cohabit a man-made space. Lydia’s paintings take one through the diverse emotional reactions of individuals who have experienced trauma. Each subject is videoed while sharing their story, and a single frame is taken from that recording. Every painting begins with a purple grisaille and is covered with multiple glazes. Purple is important in the process for Lydia because the color is reminiscent of bruises and represents emotional scars and bruises that people collect through their life. More information: Lydia Humphreys, 417.629.2905. December 11: Dog Day Afternoon: Happy Holidays Event, 4:00–6:00pm at Joplin Public Library (1901 E 20th St). The Holidays have gone to the Dogs. The furry friends are back for a special holiday themed event. Children up to fifth grade and their families are invited to come read to a dog, hear a story from Mrs. Claus, have a cookie, and complete a craft. The Therapy Dogs from Dog Day Afternoon will be dressed for the occasion and ready for their photo op. More information: Tammie Benham, 417.623.7953. December 14: Local Color’s Holiday Open House, 5:30–8:30pm at Local Color Art Gallery & Studio (1027 S Main St). Celebrate the beginning of the holiday season at Local Color’s Holiday Open House. Find the perfect gift for everyone on your list…and maybe even something for yourself! Enjoy refreshments while meeting the artists. Items for sale include: pottery, paintings, fiber art, scarves, wood turnings, angels, furniture, sculpture, glass, silver and beaded jewelry, and much more. More information: Sandy Robinson, 417.553.0835. December 15: The Met Live in HD presents La Traviata, 11:55am at Regal Cinemas Northstar 14 (201 S Northpark Ln). Yannick Nézet -Séguin conducts Michael Mayer’s richly textured new production featuring a dazzling 18th-century setting that changes with the seasons. Tickets: $24 Adult, $21.82 Senior, $17.45 Child. Click here for more information about Fathom Events. December 15 & 16: Struggle for Education, 1:00pm at George Washington Carver National Monument (5646 Carver Rd, Diamond, MO). Join in for this program and explore some of the challenges George Washington Carver faced in his pursuit of a formal education while growing up in the post-Civil War United States. This event is free and open to the public. More information: Randall Becker, 417.325.4151. December 17: Downtown Poetry Reading and Open Mic, 6:00–8:00pm at Joplin Ave Coffee Company (506 S Joplin Ave). This month will feature poets Elijah Burrell and Shevaun Brannigan. Open Mic sign-ups begin at 6:00pm. Featured poet will begin reading at 6:15pm. Open mic starts at 7:00pm. This event occurs on the third Monday of each month. More information: DowntownPoetry@gmail.com or send them a message through Facebook. December 22: JRAC Coffee Hour, 10:00am at Beckett’s Cafe (705 Illinois Ave). Joplin Regional Artists Coalition (JRAC) Coffee Hour offers JRAC members the opportunity to network, socialize, announce personal art-related news, discuss a pre-determined general art topic, or participate in a professional development workshop. JRAC Coffee Hours are held on the fourth Saturday of each month and you must be a JRAC Member to attend. Membership dues for JRAC are $35 annually. JRAC is a not-for-profit established to empower visual artists in the area by helping them network with other artists and the community-at-large. More information: Marta Churchwell. December 22 & 23: Christmas in Yellowstone, 1:00pm at George Washington Carver National Monument (5646 Carver Rd, Diamond, MO). Stretching across more that 2.2 million acres, Yellowstone National Park was designated America’s first national park in 1872. Only a small fraction of visitors experience the park during winter months, a time when nature’s inhospitality is matched only by its serenity. This film will last about 52 minutes. More information: Randall Becker, 417.325.4151. December 29 & 30: The Tuskegee Airman, 1:00pm at George Washington Carver National Monument (5646 Carver Rd, Diamond, MO). In 1941, with the world at war, a select group of African Americans made their way to Tuskegee, Alabama, with dreams of becoming the first black fighter pilots in the country. This documentary explores the story of the Tuskegee Airman. This film is free and open to the public. More information: Randall Becker, 417.325.4151. Saturdays: Joplin Empire Market + Holiday Market, 10:00am–3:00pm at Joplin Empire Market (931 E 4th St). The Joplin Empire Market is the place to find the best in locally grown produce, gourmet foodstuffs, and handmade artisan goods. Housed in a historic brick building adjacent to downtown, this indoor/outdoor public market is Joplin’s newest gathering spot. During the holiday season, Joplin Empire Market will add on a Holiday Market. This special section of the market will feature goods that are sure to help make your holiday season merry and bright! More information: Ivy Hagedorn, 417.986.3914. December 17–January 18: 5th Annual K-12 Art Show, Missouri Southern State University, Spiva Art Gallery (3950 Newman Rd). This non-competitive exhibit is arranged by grade level in order to show creative development by grade. It includes a variety of 2D and 3D works including paintings, clay sculptures, cardboard constructions, and works made from found objects. Sponsored by District 9 of the Missouri Art Education Association, the 5th Annual K-12 Art Show features artwork created by students from throughout Southwest Missouri. Receptions: January 12, K-4th Grades from 1:00–3:00pm and 5th-12th Grades from 3:00–5:00pm. December 3–8: Missouri Southern State University Senior Capstone Exhibitions, Missouri Southern State University, Spiva Art Gallery (3950 Newman Rd). The BFA Senior Show at Missouri Southern State University will feature Jocelyn Lechuga, Makenzie Wesley, and Lydia Humphreys. Jocelyn’s work is about her Mexican heritage. Folk stories, Latino icons, music, and mask-wearing wrestlers are just some of it. She blends pop culture with her heritage, drawing inspiration from both equally. She also enjoys exploring other important things that make Mexican culture what it is, and how it’s represented to the world – such as the Day of the Dead. The unparalleled beauty and diversity found in nature is a source of inspiration for Makenzie as she creates her current body of work. Being a native of the Midwest, her ceramic work contains imagery of indigenous moths and butterflies that populate this region. The metamorphism lepidopterans undergo parallels the process of ceramics. As a moth or butterfly must change form and nature into a different state, Makenzie’s ceramic pieces must endure a metamorphosis of their own to reach completion. She challenges human perspective and our interaction with insects by magnifying them to a larger scale, forcing the natural world to cohabit a man-made space. Lydia’s paintings take one through the diverse emotional reactions of individuals who have experienced trauma. Each subject is videoed while sharing their story, and a single frame is taken from that recording. Every painting begins with a purple grisaille and is covered with multiple glazes. Purple is important in the process for Lydia because the color is reminiscent of bruises and represents emotional scars and bruises that people collect through their life. More information: Lydia Humphreys, 417.629.2905. November 2–December 21: Joplin Inspired by Joplin Regional Artists Coalition, Spiva Center for the Arts, Upstairs Gallery (222 W 3rd St). The Joplin Regional Artists Coalition will showcase a variety of works by their members throughout the months of November and December. October 20–December 15: 71st Annual Membership Show, Spiva Center for the Arts, Main Gallery (222 W 3rd St). Over 100 Spiva member artists present their best work in this annual showcase of regional talent. A fascinating mix of styles and media. Awards will be presented in all categories. October 20–December 15: To Everything There is a Season by Gloria Baker Feinstein, Spiva Center for the Arts, Regional Gallery (222 W 3rd St). Artist Statement: “I have always been compelled to study, frame and attempt to make sense of the world around me. I happen to use a camera to do so. Photography is my constant companion and has been my life-long passion. Like a hunter, my senses are fully engaged. I am looking, I am waiting, I am poised to press the shutter. It can be a lonely and challenging venture, but one that I feel compelled to take on. Day after day, season after season, year after year. It is with a fierce sense of wonder and an open heart that I navigate through the world, camera always close at hand. The pictures I make are proof of my journey – pieces of evidence scattered alongside the footsteps I leave behind.” Gloria has been a long-time friend of Spiva, exhibiting in multiple PhotoSpiva exhibits and serving as the juror in 1987. The exhibit displays approximately 30 photographs from 5 distinct bodies of work: Jamison Park, Grandmother with a Camera, Appalachia, Convergence, and Dreams and Other Things. Spiva is honored to feature her excellent work. See more at gloriabakerfeinstein.com. October 2–December 28: Energetic Connections by Diana Bray, Joplin Public Library (1901 E 20th St). Diana states “My abstract paintings are direct expressions of “what’s in the back of my mind” and often surprise me once completed. I begin by placing interesting elements together, such as small shapes I’ve picked up in parking lots. Getting into the flow, I glue and paint until the piece feels finished. Then I step back and look at it “with fresh eyes” and, suddenly, I know what it’s about. This is how the painting about the Joplin tornado was created. Only after it was finished did I realize that everything in it was about the tornado. Some of these paintings are about intuitive connections with nature and with other people. Others are about the idea that we are creating our lives by what we focus upon and what we expect. The great thing about art is that each of us has our own personal way of experiencing it.” Diana Bray is a Joplin artist who paints in both abstract and realistic styles. With a combined degree in psychology and art from Phillips University (Enid, OK), she also is a licensed professional counselor. Gardening and archaeology are hobbies and interests that are also sometimes reflected in her paintings. Diana has won a number of awards, has exhibited internationally, and her work may be found at Cherry’s Art Gallery in Carthage, MO. Assorted works from area artists. December 1: Bison Sculptures (Ages 6+), 10:00am–Noon at Pawpaw Patch Productions (4940 Highway 43, Joplin, MO 64804). Sculpt your own bison (the correct name for buffalo) from polymer clay. While your sculptures cure, Cyndi Cogbill will provide a special program on North American Bison. More information: Cyndi Cogbill, 417.553.1583. Cost: $25 for first person; $12 for additional family members. Adults helping children are free. Clay and materials will be provided. Register by calling or emailing Cyndi. December 1: Watercolor Holiday Cards with Sandra Conrad (Ages 12+), 11:00am–1:00pm at Spiva Center for the Arts (222 W 3rd St). Make your holiday cards extra special this year by making your own with watercolor. More information: Jade Henning, 417.623.0183. Cost: $20. December 4: Make & Take Polymer Clay Class (Ages 15+), 6:00–9:00pm at Pawpaw Patch Productions (4940 Highway 43, Joplin, MO 64804). By request, Cyndi Cogbill will assist students in making light switch plates, leaf bowls, and memory pendants. More information: Cyndi Cogbill, 417.553.1583. Cost: $25 per person. Clay and materials will be provided. Register by calling or emailing Cyndi. December 5: Preschool Nature Connections: Feeding Our Feathered Friends (Ages 3-6), 1:00–2:00pm at Joplin Empire Market (931 E 4th St). Explore with us as we learn where bird get their food (since they don’t have a bird grocery store), where they live in the colder months (hint: they don’t have apartments or fireplaces to keep them warm), and how we can create a bird feeder to extend a special treat for our feathered friends. Please see Wildcat Glades’ Facebook page for instructions on how to register. More information: Robin Standridge, 417.708.7713. Cost: Free. December 6: Vet Art Classes – Wood Carving, 6:00–8:00pm at Spiva Center for the Arts (222 W 3rd St). Join veteran Charles Hood and wife Theresa Hood as they teach you to make your own hand-carved wooden ornament. Tools provided. Veterans only. More information: Jade Henning, 417.623.0183. Cost: Free. December 8: Preschool Nature Connections: Feeding Our Feathered Friends (Ages 3-6), 10:00–11:00am at Joplin Empire Market (931 E 4th St). Explore with us as we learn where bird get their food (since they don’t have a bird grocery store), where they live in the colder months (hint: they don’t have apartments or fireplaces to keep them warm), and how we can create a bird feeder to extend a special treat for our feathered friends. Please see Wildcat Glades’ Facebook page for instructions on how to register. More information: Robin Standridge, 417.708.7713. Cost: Free. December 8: Yoga In Nature For Kids (Ages 2+), 11:15–11:45am at Joplin Empire Market (931 E 4th St). Led by Amanda, a registered yoga teacher from 4-States Yoga Studio, this class is designed to incorporate elements of fun, breathing, and yoga poses specifically for kids. Bring your yoga mat or a towel and a reusable water bottle. Please see Wildcat Glades’ Facebook page for instructions on how to register. More information: Robin Standridge, 417.708.7713. Cost: Free. December 8: Yoga In Nature For Adults, Noon–12:45am at Joplin Empire Market (931 E 4th St). Led by a registered yoga teacher from 4-States Yoga Studio, this class is designed to incorporate yoga poses for all levels of experience. Bring your yoga mat or a towel and a reusable water bottle. Please see Wildcat Glades’ Facebook page for instructions on how to register. More information: Robin Standridge, 417.708.7713. Cost: Free. December 8: Printmaking Luminaries with Sarah Serio (All Ages), 1:00–3:00pm at Spiva Center for the Arts (222 W 3rd St). Let the light shine this winter by creating your own unique set of luminaries. Start by carving your own creation into a lino block and then print the design by hand. More information: Jade Henning, 417.623.0183. Cost: $25 per project. December 8: Glass Ornaments with Jane McCaulley (Ages 9+), 2:00–4:00pm at Spiva Center for the Arts (222 W 3rd St). It’s the holiday season! What’s a better way to get started than by making your own glass ornaments? More information: Jade Henning, 417.623.0183. Cost: $40. December 9: LEGO Club, 2:00–3:00pm at Joplin Public Library (1901 E 20th St). Children can build with Legos, Kapla blocks, Lincoln Logs, foam blocks, and more. Toddlers, preschoolers, and elementary age children all welcome. Anyone under 6 years must be accompanied by an adult. More information: Tammie Benham, 417.623.7953. December 11: Ceramic Christmas Tree Workshop, 6:00–8:00pm at Local Color Art Gallery & Studio (1027 S Main St). Join Daria Claiborne and make your own ceramic Christmas Tree. Create a new Christmas tradition! More information: Sandy Robinson, 417.553.0835. Tuesday from 9:00am–Noon & Wednesday from 4:30pm–7:30pm: Painting with Pam Leisenring at Hobby Lobby (1315 S Rangeline Rd). Pam has been teaching fine art classes privately for 32 years and continues to bring individualized instruction to expand the artistic experience of beginners and established artists alike. Each student chooses a preferred medium (Acrylic, Pastel, Watercolors, etc.) and subject matter. These are ongoing classes and students may join at any time. New members always welcome. More information: call 417.781.3839. $20 per class, all materials provided for first class. Wednesday: Wednesday Classes at Local Color, 2:00–6:00pm at Local Color Art Gallery & Studio (1027 S Main St). Calling all “big kids” for a weekly drop-in painting class for adults! Decide when to come and how long to stay. With up to 4 hours of painting time, you can both accomplish and enjoy more personal instruction. Paula Giltner teaches realism watercolor and acrylic painting techniques and design principles. Bring any materials you have for the first lesson and learn about the materials you might need for additional lessons. The fee is $20 per class. More information: Sandy Robinson, 417.553.0835. Wednesday: Wednesday Experimental Painting Class, 10:30am at Local Color Art Gallery & Studio (1027 S Main St). Local Color artists will be leading an experimental painting class using watercolors or fluid acrylics. Cost is $25 per class with materials provided by the instructor. Let Local Color help you discover your inner artist or perhaps help you build upon your current skills. Class size is limited to six, so students must register prior to each Wednesday session. More information: Sandy Robinson, 417.553.0835. Third Thursday: Painting and Sculpting with April Davis, 6:00–8:00pm at Local Color Art Gallery & Studio (1027 S Main St). Students may choose to create an acrylic painting or a sculpture. April Davis will guide you through her simple techniques that make painting or sculpture easy and fun for all levels – beginner to advanced! Cost: $30 per class. More information: Sandy Robinson, 417.553.0835. Tuesday: Creation Station with Sandra Conrad (Ages 6–11), 3:45–5:00pm at Spiva Center for the Arts (222 W 3rd St). Drop in Tuesday afternoons and experiment with a variety of media: painting, drawing, clay, collage, sculpture, and printmaking. Explore the galleries with scavenger hunts and other activities. Pre-registration is recommended. Space is limited in this popular class. Sponsored by Dr. John and Joy Cragin. More information: Jade Henning, 417.623.0183. Cost: $6 pre-registration ($8 at the door). Thursday: Memories in the Making®, 10:00am–Noon at Spiva Center for the Arts (222 W 3rd St). This art experience is centered on the expression of creativity through painting for those dealing with memory loss. There is no charge for the class and no prior art experience is necessary. Memories in the Making® is hosted by the Alzheimer’s Association, Greater Missouri, in conjunction with George A. Spiva Center for the Arts. Sponsored by St. Avips. The class is held weekly from March 1–November 16. More information: Jade Henning, 417.623.0183. Saturday: Mini Makers with Amy Mullins (Ages 3–5), 10:30–11:30am at Spiva Center for the Arts (222 W 3rd St). These workshops are for the smallest artists in your family! At each session, students will create projects around a theme. Led by teacher and artist Amy Mullins. Get ready for an hour of fun and creativity for you little ones! Adult must accompany child. More information: Jade Henning, 417.623.0183. Cost: $6 preregistration and $8 at the door. Friday: Date Night, until 8:00pm at Firehouse Pottery-Joplin (112 S Main St). Looking for something different to do on a Friday night? Firehouse Pottery-Joplin has something just for you. Friday nights are date night 2-for-1 studio fees until 8:00pm for all couples. More information: 417.553.0671. Tuesday: Ladies’ Night Out (Ages 18+), until 8:00pm at Firehouse Pottery-Joplin (112 S Main St). Ladies! Gather your girls and enjoy a creative evening with Firehouse Pottery-Joplin and free studio fees as well. More information: 417.553.0671. Tuesday & Saturday: Makerspace Open Studio, 4:00pm–7:30pm on Tuesday and 9:30am–2:30pm on Saturday at the Joplin Public Library Makerspace (1901 E 20th St). Post Art Library, Joplin Public Library, and Joplin Makers have partnered for Second Saturday Makerspace Open Studio events. On the second Saturday of each month, the Joplin Public Library Makerspace will be open on a walk-in, first come, first serve, basis. You do not need a library card to use the maker space. Use of all makerspace equipment is free (though a small fee applies to 3D prints) and open to the public. Patrons under the age of 18 must be accompanied by parents or legal guardian to use the maker space during this event. Makerspace equipment is in-house use only. More information: Jill Sullivan, 417.623.7953 x1041.